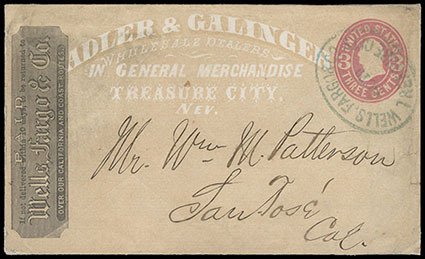 Adler & Galinger, Wholesale Dealers in General Merchandise, Treasure City, Nev., all over advertising in buff on 3¢ Wells, Fargo & Co. entire to San Jose with company frank at left, nice strike of "Wells, Fargo & Co., Treasure City" oval handstamp in blue, couple minor edge tears and reinforcement, F.-V.F. 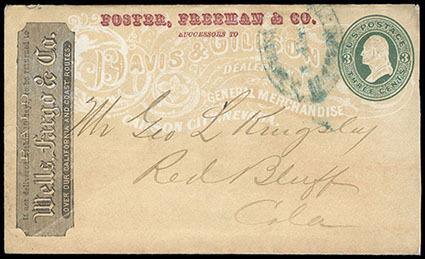 Forster, Freeman & Co, Successors To (red overprint on) Davis & Gillson, Dealers in General Merchandise, Carson City, Nevada, all over advertising in buff on 3¢ Wells, Fargo & Co. entire to Red Bluff with company frank at left, indistinct "Wells, Fargo & Co." oval handstamp in blue, slightly reduced at right, F.-V.F., very few overprints on Wells, Fargo & Co. advertising envelopes are known, this probably being the only one from Nevada. G.W. 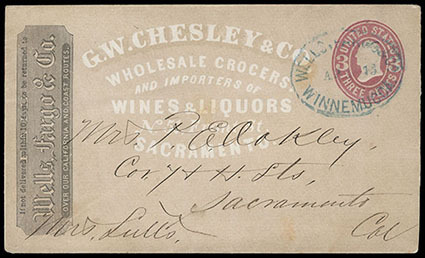 Chesley & Co., Wholesale Grocers and Importers of Wines & Liquors, Sacramento., all over advertising in gray on 3¢ Wells, Fargo & Co. entire to San Francisco with company frank at left, nice strike of "Wells, Fargo & Co., Winnemucca" oval handstamp in blue, flap replaced and slight split at top, Very Fine. 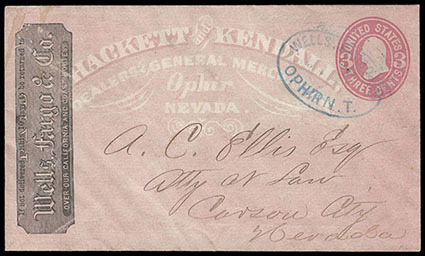 Hackett and Kendall, Dealers & General Merchandise, Ophir, Nevada, all over advertising in pink on 3¢ Wells, Fargo & Co. entire to Carson City with company frank at left, bold strike of scarce "Wells, Fargo & Co., Ophir, N.T." oval handstamp in blue, appears to have been used as a paste-up, Very Fine and attractive. 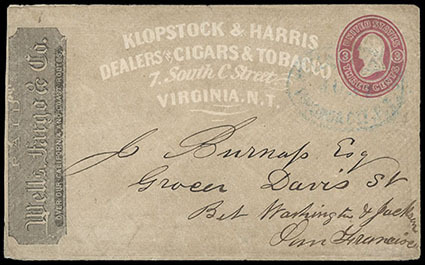 Klopstock & Harris, Dealers in Cigars & Tobacco, Virginia, N.T., all over advertising in gray on 3¢ pink Wells, Fargo & Co. entire to San Francisco with company frank at left, light strike of "Wells, Fargo & Co., Virginia Cty., N.T." oval handstamp in blue, reduced at left, F.-V.F. 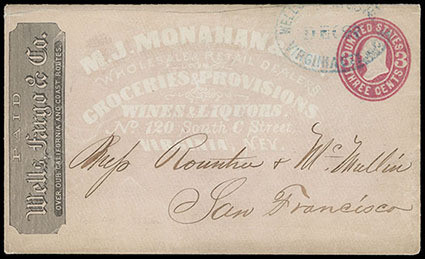 M.J. Monahan & Co., Groceries & Provisions, Virginia City, Nev., all over advertising in buff on 3¢ Wells, Fargo & Co. entire to San Francisco with company frank at left, nice strike of "Wells, Fargo & Co., Virginia Cty." oval handstamp in blue, flap replaced & slight split at top, Very Fine appearance. M.V. 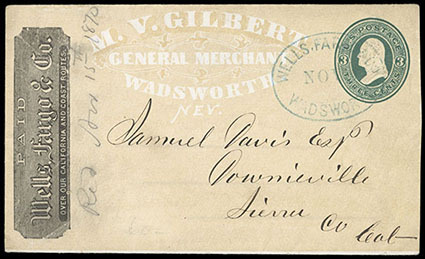 Gilbert, General Merchant, Wadsworth, Nev., all over advertising in buff on 3¢ green Wells, Fargo & Co. entire to Downieville with company frank at left, nice strike of scarce "Wells, Fargo & Co., Wadsworth" oval handstamp in blue, pencil docketing "Re'd Nov. 15th, 1870", Very Fine and attractive. 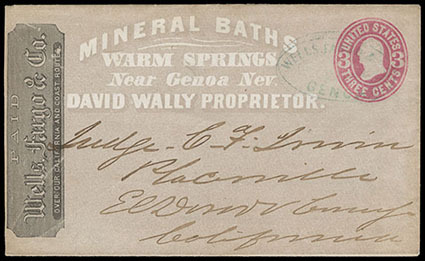 Mineral Baths, Warm Springs, Near Genoa, Nev., all over advertising in gray on Wells, Fargo & Co. 3¢ entire to Placerville with company frank at left, light strike of scarce "Wells, Fargo & Co., Genoa" oval handstamp in blue, trivial cover reduction at left, Very Fine and scarce. 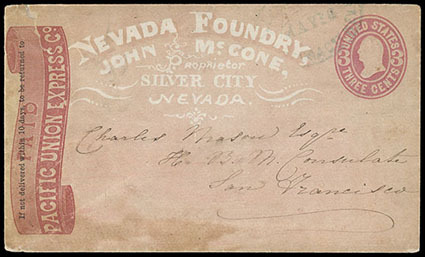 Nevada Foundry, John McCone, Silver City, Nevada, all over advertising in pink on 3¢ pink Pacific Union entire to San Francisco with red company ribbon frank at left, light strike of what appears to be "Wells, Fargo & Co., Virginia Cty., Nev." oval handstamp in blue, light staining & wear, F.-V.F. 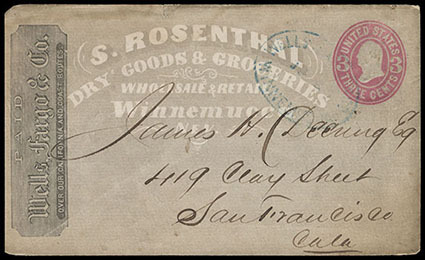 S. Rosenthal, Dry Goods & Groceries, Winnemucca, Nev., all over advertising in gray on 3¢ Wells, Fargo & Co. entire to San Francisco with company frank at left, light strike of scarce "Wells, Fargo & Co., Winnemucca" oval handstamp in blue, trivial cover wear, F.-V.F., ex-Barkhausen.